For over a month now I have been working on a bike chariot. 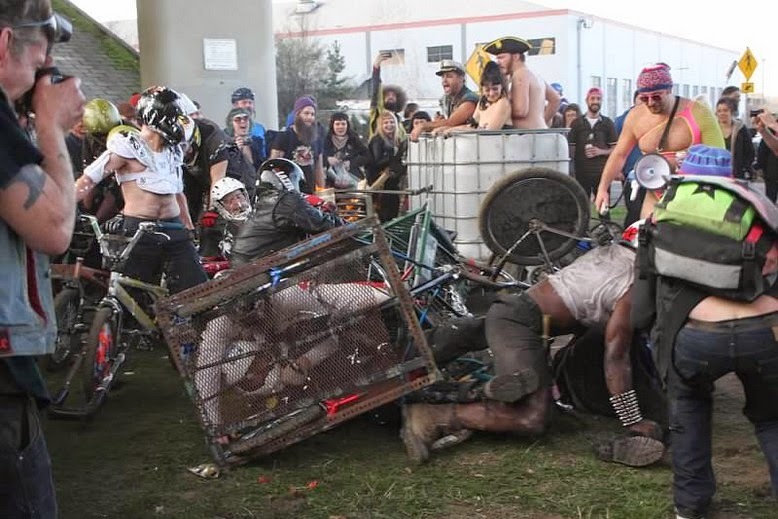 This was all in preparation for Portland's Minibike Winter 2015. It is almost a week of stuff culminating in the Zoo Bomb on Sunday. 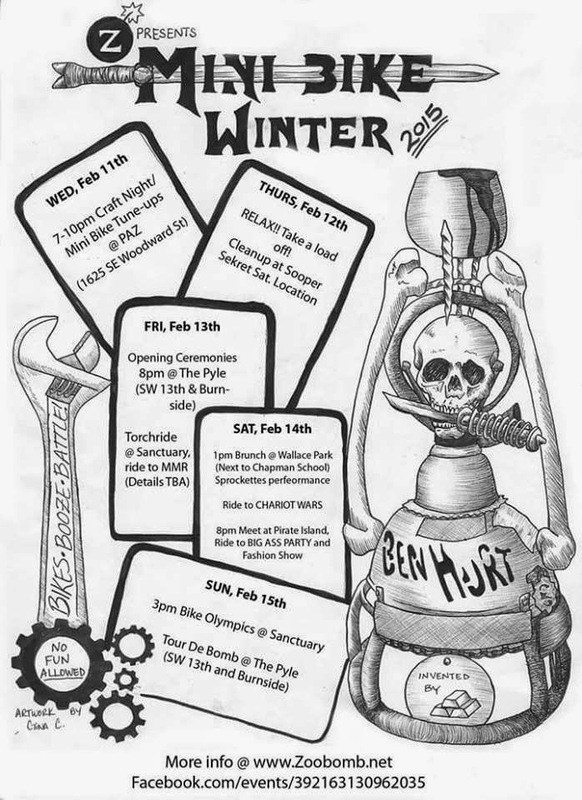 One of the butter events is the Ben Hurt bike chariot war on Saturday. All in all I was pretty excited. I got into Portland on Friday afternoon and spent a lot of that night biking around. Went up to the Sanctuary and came back via the Zoo Bomb route. Then got lost on the way to the party. Eventually found it on the other side of the river. A ton of people hanging out around a big pallet fire under a freeway bridge. I love that this is a thing that happens. Saturday I met up with the rest of the crew and put the finishing touches on the chariot. I also bought some shin guards which I would be very thankful for later. The meetup for the chariot war was not the battlefield itself. I think that was mostly because the event is not really sanctioned by any sort of government agency. So we hung out for a while waiting for the thing to really get going. When it did the whole mass of people, and there were a couple hundred people, rode off to a place to skirmish in peace. The location turned out to be under a freeway again in an industrial part of town. It took some times to get things ordered and everyone set to go. Soon enough the goons running it were able to get the battle going. Remember I say battle, because this wasn't a race. The goal wasn't to complete some number of laps. The goal was to still be holding onto your chariot at the end of the race. I had expected things to get violent pretty quickly, but as the race started everything was actually pretty calm. My partner and I did one lap with no real interference. After that things went down hill. Chariots would crash into each other and the various participants would try to yank opponents off their contraptions. Imagine a rugby match held on a tangle of bicycles. One girl sliced her finger open on the chainring on my bike. It was far more brutal a contest than I was expecting, but not in the way I thought. Besides the other teams competing their was a bicycle chariot hot tub. Whichwas amazing and served no purpose whatsoever. Then again, the whole contest is a crazy idea in the first place, so what is wrong with a bit more chaos? Speaking of chaos, the crowd isn't just sitting their. They are actively participating in the event by throwing things into the arena. So most of the time random fireworks are going off. I got hit in the back of the helmet with an egg. The competitors were also being showered with all sorts of stuff. Water. Shaving cream. Baby powder. 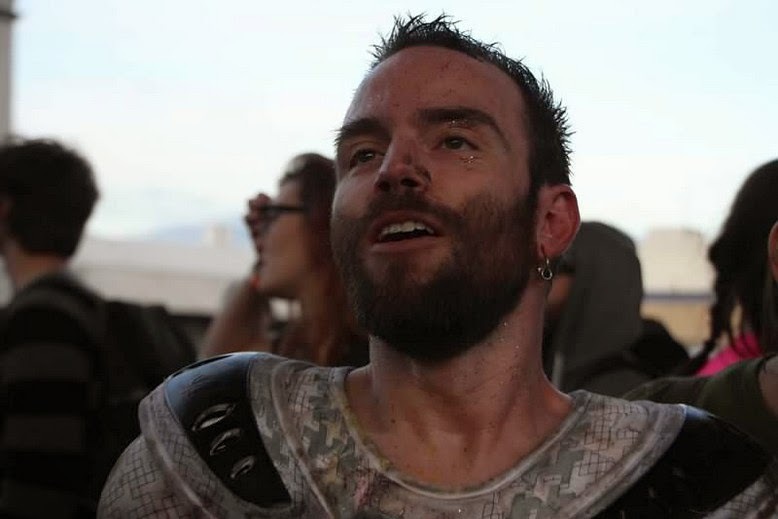 I even got splattered a few times with chilli. Yes, someone on the sideline had about 2 gallons of chilli and was using a ladle to toss it into the ring. Finally, there was glitter. Yep, glitter. With the help of some sweat, dirt, and chilli, it stuck to everything. I have not been that gross for a long time. In spite of this, my team did pretty well at avoiding most of the major entanglements. I was happy to let others winnow down the contestants. We ended up being part of the last three teams still competing. I was knocked pretty much off my bike by one guy but managed to hold on with one hand. In the process my charioteer was able to force him off the bike bringing it down to two teams. Or so you would think. The guy who had been pushed off started yelling at me that he had gotten me off the bike first. Which he hadn't. So then he just tackled me. Frankly I was a little confused by the whole interaction. I mean, at least one of us was no longer competing right? So what as the point? After a little while of being pushed into the ground the other guy gave up. Now there really are only two teams left. The other team in question was led by the girl who had sliced her finger open already. I was worried that someone, and it wasn't that unlikely the person would be me, would be seriously injured. Frankly by that point I was also mentally pretty well finished. I got off my bike and congratulated the other team on their victory. It was one hell of an event. Like nothing I had ever done before. I am glad I could have been a part of it, but I am also glad I made it out with nothing more than a few scrapes and bruises.